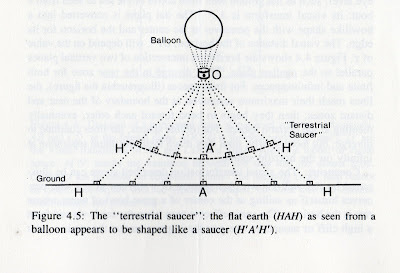 Anyone familiar with this blog will probably know that I became fascinated with the flat earth topic last year - a fascination which continues. It led me to question many of my previously held assumptions and I've since been trying to understand the world from the ground up - i.e. from a first person perspective. Using evidence from my own eyes and other senses as my primary source of information. 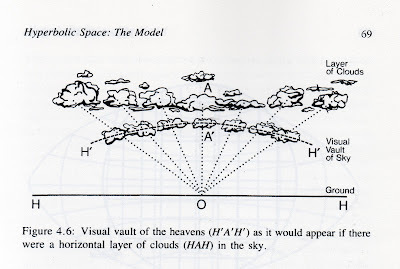 Anyway, inspired by the arguments made by leading flat earthers concerning perspective, I quickly began to realise that much of what we see in the sky follows curved lines of perspective. Just watching airplanes fly overhead, or the passage of the Sun or Moon across the sky shows that they follow curved paths relative to the observer. After searching online I found that the correct name for what I'd been noticing was hyperbolic vision (or hyperbolic perspective). I also came across the following book on Google Books, which I felt compelled to purchase. That was back in about March of this year, and since then I've slowly been worming my way through the book in between other things. 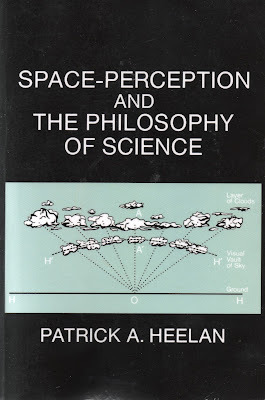 The book is called Space-Perception and the Philosophy of Science by Patrick A. Heelan. First a note on the author. Patrick Aidan Heelan was an Irish-American physicist and philosopher of science. He died quite recently in 2015, and was professor of philosophy at Georgetown University. This particular book was published by the University of California Press, Berkeley. Oddly, at least to my mind anyway, he was also a Jesuit priest. Maybe this isn't surprising given his Irish background, but it still seemed a little strange to me. The book is a very academic work, and it wouldn't have led me to think it was the work of a modern day Jesuit had I not read it on his Wikipedia page. In fact, for anyone thinking about reading the book themselves be warned it is very heavy going. I had to reach for the dictionary on quite a few occasions xD There's also a fair bit of maths involved. It's well worth reading and I feel very fortunate to have found it, but it's not a light read by any stretch of the imagination. 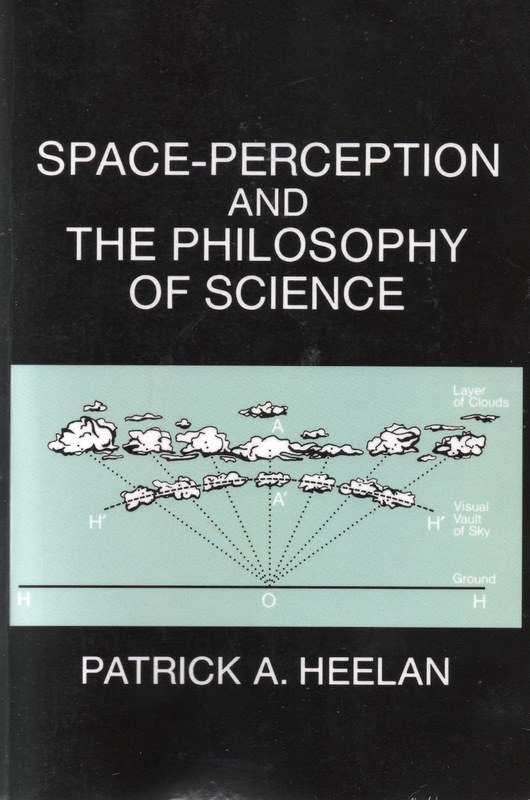 The book is mainly focused upon how we interpret the information we receive through our senses and scientific instruments, and the implications this may have regarding our wider scientific philosophies. 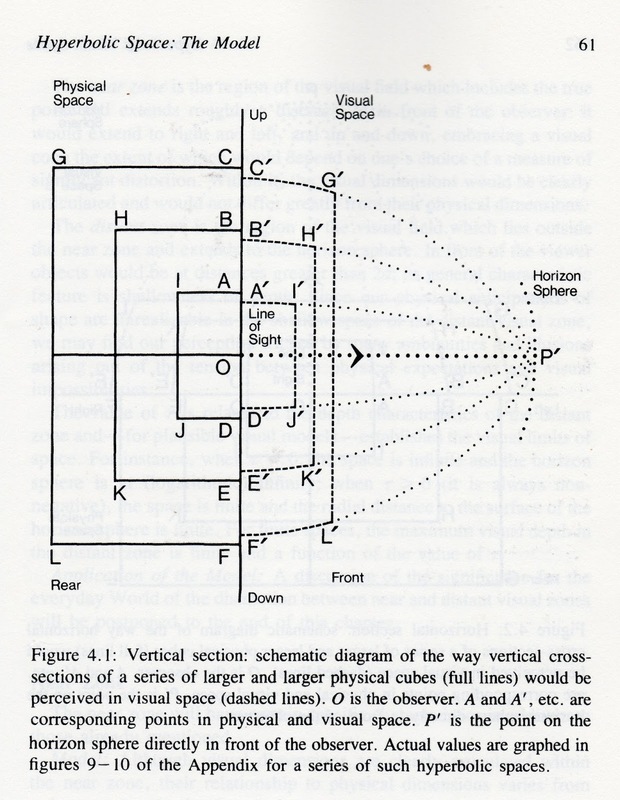 It also makes the case that hyperbolic vision describes the world we see and experience better than Euclidean geometry does in certain cases. It would be very difficult for me to do the book justice in a few short paragraphs, and I fear if I try to explain it I may end up misrepresenting the ideas and themes contained within - either through my inability to articulate them, or through my own misunderstanding of them. Like I said, it's quite a heavy going book. So I thought I would make things a little easier by simply sharing some of the images from the book. This first one seeks to illustrate the way hyperbolic space (i.e. visual perspective) creates a curved image of the actual world. 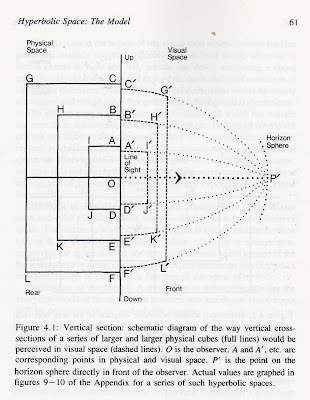 If I'm interpreting it correctly the boxes on the left of the line represent the actual world, and those on the right represent what the observer would actually see. The image may seem a little confusing at first, but once you realise that the horizontal line in the centre (the one with the arrow on it) represents the ground and the person is standing at the centre looking towards "P'" it starts to make a little more sense. It might be easier if you imagine the "boxes" to be very large buildings or structures of some sort - like you're in a huge hall or corridor and the ceiling seems to be sloping to the horizon as it gets further from you. The next two images should seems a little more straight forward. 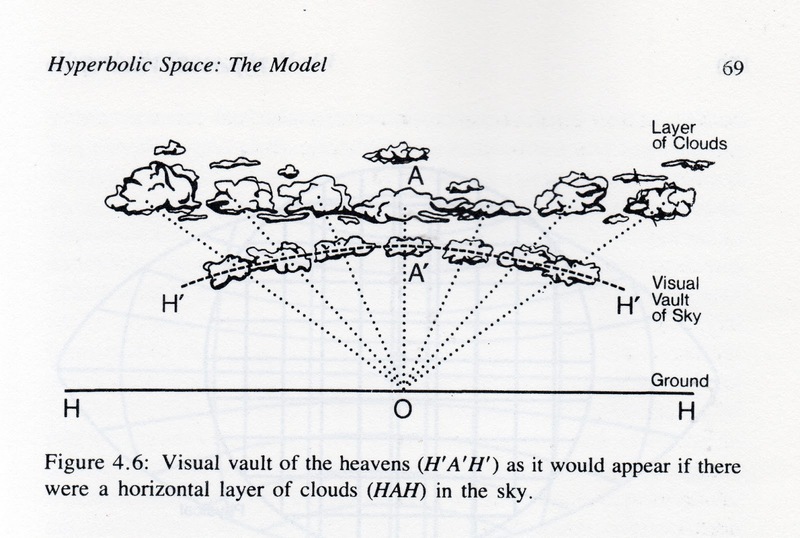 One shows how the clouds or sky seem to create a dome shape over your head due to these effects of perspective, and the other shows the same effect but looking down at the ground from a balloon, with the ground appearing to curve upwards. 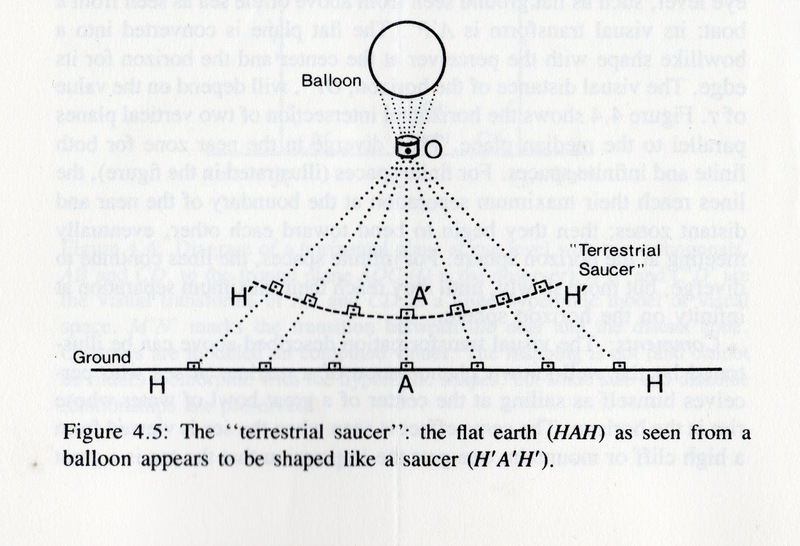 If you can read the text under the second image you may notice it states "the flat earth as seen from a balloon". No doubt the flat earth reference is just pure coincidence, either way though I'm sure you can all make up your own conspiracy theories about Jesuit priests hiding flat earth in plain sight. I'll leave things there for now. Interestingly, the book also talks about how hyperbolic space may have been utilised by artists such as Vincent van Gogh in the past. This will be the topic of my next blog post. Effectively a "Part 2" to this post.